Howard Baker was an American politician, the US Senate majority leader and a Chief of Staff in Ronald Reagan’s White House. He has the Sun and Moon conjunct in Scorpio with an Aries Ascendant so plenty of the passion, strength and ruthless assertiveness required to reach the very top of the political ladder. Baker, however, was known in Washington as the “Great Conciliator”, and one of the most successful senators in terms of brokering compromises, enacting legislation, whilst maintaining civility and always remained a popular figure with members of both parties. Conciliation and compromise are not generally associated with this Sun, Moon, Ascendant combination. The Sun and Moon, however are in the 7th house alongside Venus and Mars. Both the 7th sign, Libra and house require compromise and cooperation, whilst working well in partnerships to achieve one’s goals. The Capricorn Research Project has shown that public figures are far less likely to have their Sun in the 7th house than in the 1st or 12th, because the 7th house requires its tenants to take much greater notice of the themes within their marriage and people with a strong 7th house are often required to sacrifice much of the career and personal goals in order to take account of the needs of their partner. 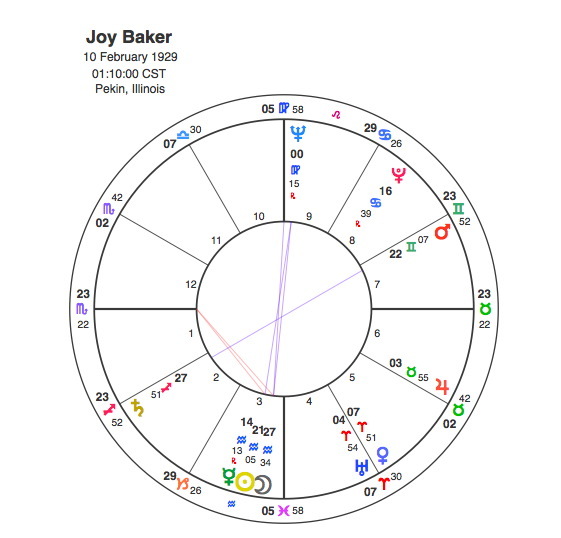 Howard Baker has Jupiter in the 10th house close to the Midheaven and this is generally a position that points to a successful and powerful career. Jupiter here is opposed to Pluto at the base of the chart which suggests that this career would be disrupted by a powerful and sudden change in family circumstances. This opposition creates a wide T Square to Baker’s Ascendant which suggests that the tension implicit in the opposite pulls of Jupiter and Pluto would have a big impact on the expression of his own personal issues. Pluto would play a major role in Howard Baker’s life, hardly surprising since it rules the sign of his Sun and Moon and is placed right at the very base of his chart so its transits would impact deeply on his family and the very core of his being. The first sign of this was when Pluto closed the square aspect to his Ascendant in 1933 – 4, he was only 8 years old when his mother died. Joy Baker, Howard’s wife was used to life in a political family being the daughter of a US Senator. Joy served on the boards of the Kennedy Center for the Performing Arts, Ford’s Theater, Bradley University, Knoxville College and the Knoxville Symphony Society. Her profound interest in the Arts was evident from her Sun and Moon in Aquarius in opposition to Neptune. This opposition formed a T Square with her Ascendant at 23 degrees Scorpio exactly conjunct Howard’s 7th house Sun. Sun / Ascendant aspects between married couples are quite common and a sign of strong physical attraction. As Joy’s Sun and Moon were in aspect to her Ascendant and Howard’s Sun her whole life would be very strongly plugged into the themes that Howard would have to experience. The words “ soul mate “ can be overused but certainly not in this case. Howard and Joy were made for each other and they married in December 1951. In a case like Joy’s where the Sun, Moon and Ascendant are all in aspect together, transits are simplified because all three would be affected at the same time. This means that Pluto would only have two major transits in her whole life. Pluto was opposite Joy’s Sun and square her Ascendant and Howard’s 7th house Sun from October 1951 to October 53. The second one happened when Joy was 64. Pluto was conjunct her ascendant and square her Sun and it was also conjunct Howard’s Sun from Nov 1992 to Sep 1993. Anyone with an understanding of astrology and certainly anyone who has read these pages would sadly be in no doubt about what happened. Joy died of Cancer in April 1993, Pluto took away Joy’s body ( Ascendant ) and Howard’s wife ( 7th house Sun ). For Joy these were the only two major transits but for Howard there were 3 other conjunctions that Pluto had to make before it reached his Sun. In many ways, Howard’s career peaked as Senate majority leader from 1981 -4, Pluto was opposite his Ascendant and conjunct his Mars from December 1980 to October 1984 but it was also during the conjunction to Mars that Joy had her first diagnosis of cancer. Howard Baker had considered running for the Republican Presidential nomination but abandoned it to serve as President Reagan’s chief of staff in 1987 and 1988. He was forced to resign because of his Joy’s illness in 1988. Pluto was conjunct his Moon and Saturn in 1990 – 1 and this must have been a very depressing time as he came to terms with Joy’s terminal illness. 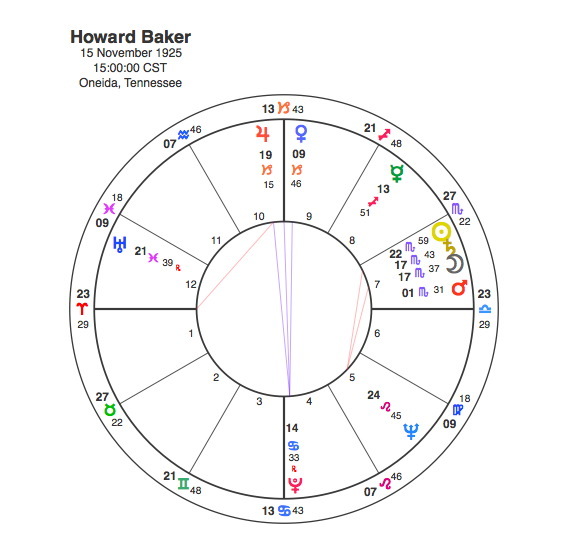 Howard Baker was forced to deal with the realities of a 7th house Sun / Moon / Saturn conjunction giving up his career just as it was at its peak in order to look after Joy. The Bakers were a close and devoted couple. Pluto brought them together but also separated them.